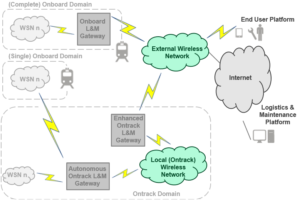 In the last decade, commercial wireless technologies have evolved, increasing their communication capabilities, but their adoption for the rail infrastructure has been focused on the train-ground communications, excluding the ground-ground and the inner-vehicle ones. Bringing new wireless communications capabilities to the ontrack infrastructure and extending and improving the communication capabilities of the onboard equipment. Providing autonomy of operation to the ontrack communication equipment by using innovative Energy Harvesting technologies. provide a level of reliability that is sufficient to compete with cabled solutions. 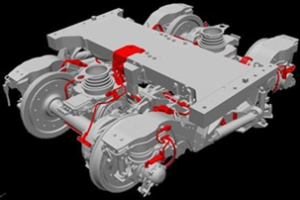 Reducing cable and installation costs both in the ontrack segment (e.g., by replacing wired sensors on track by autonomous wireless sensors) and in the onboard segment (e.g., by replacing wired sensors in the bogie unit by autonomous wireless sensors). Increasing the operational efficiency by permanently and remotely monitoring the status and position of key elements of the rolling stock and the ontrack equipment via added value applications that can be deployed as part of a cloud-based service.